English (4), Maths (4), Science (3), Languages (3), Geography (2), History (2), Art (2), Music (2), Technologies (2), Home Economics (2), Physical Education (2), Digital Literacy (2), Personal Development (1), RMPS (1). 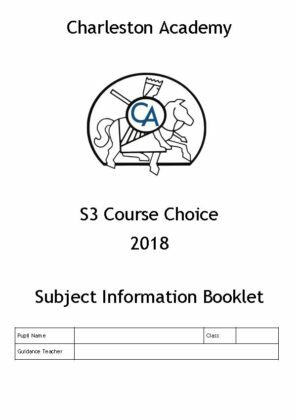 The Course Choice Booklet for pupils in S2 entering S3 in 2018 is available to download HERE. Towards the end of S2 pupils will begin to develop increased competence and aptitude in certain subjects. Therefore, while continuing with the Broad General Education of CFE S1-S3, we allow a degree of personalisation and choice for pupils as they enter S3. This allows pupils to reduce the overall number of subjects they study in S3 to 10. The subjects at Charleston Academy that make up these curriculum areas detailed on our Subject Pages. All pupils continue to study PSE, PE and RME as part of a core entitlement.